The Farm Hub hosted a 2-day workshop on interpretation for social justice for staff and partner organizations in the region and was facilitated by Caracol Language Cooperative. Creating a multilingual space is not as simple as translating or interpreting one language into another. It is also important to consider that language justice principles are being followed. In February, the Hudson Valley Farm Hub hosted a 2-day intensive workshop on interpretation for social justice for staff and members of partner organizations in the region. 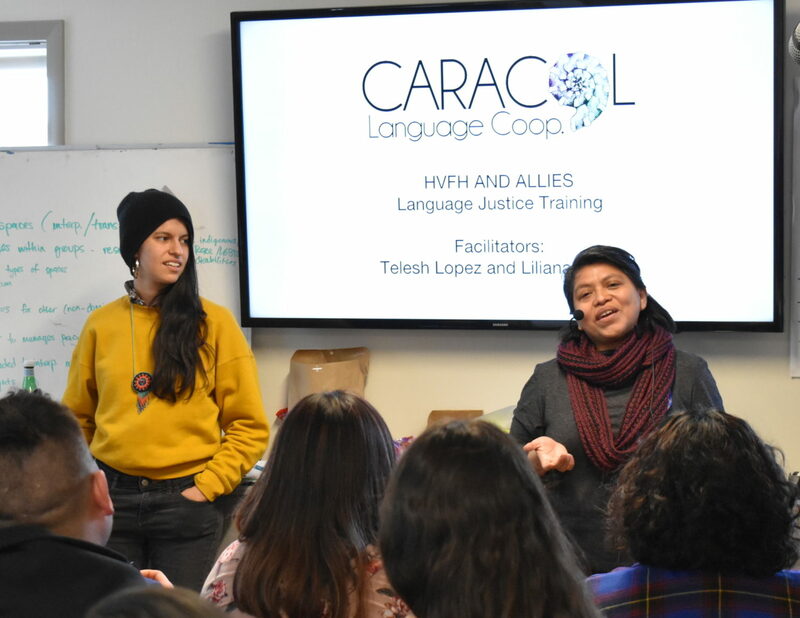 The workshop was facilitated by Caracol Language Cooperative, a Brooklyn-based worker-owned company that provides Spanish-language translation and interpretation services with a focus on social justice. The Farm Hub’s Language Justice team (see “Best of Both Worlds”) and representatives from the following organizations participated: Soul Fire Farm, Nobody Leaves Mid-Hudson, The Kingston Land Trust, White Pine Community Farm, and the Worker Justice Center of New York. Attendees also brainstormed critical components of language-justice and learned about components of a multilingual workspace including interpretation, translation, equipment, communication and documentation, planning and evaluation. The training included a rundown of techniques and strategies surrounding interpretation such as how to read an audience, the importance of using facial expressions, how to interpret through whispering, and how to interpret sayings such as “raining cats and dogs” that don’t exist in other cultures. The afternoon session also covered simultaneous interpretation with the use of equipment and included a scenario in which the speaker’s words are interpreted in real-time using special auto-transmitters, microphones, radios, and earphones. Erick, a Farm Hub production staff member and a member of the Language Justice team, says offering multilingual access allows English learners access to everything from conferences and workshops to safety trainings. It also encourages English learners to ask questions and participate in discussions. Diana Lopez Martinez, an organizer at Nobody Leaves Mid-Hudson in Ulster County, says she was quickly able to put the training to use. Lopez Martinez is a native Spanish speaker and learned English when she was three. Since she was a child she was called on to interpret for family, but she was never formally trained. On the job nowadays or these days, she often finds herself having to interpret at leadership meetings or public hearings. “I learned [that] translation isn’t the same thing as interpretation. I’d always hear ‘can you translate for me,’ but that’s really a written document whereas interpretation is verbal,” says Lopez Martinez. Now more familiar with the equipment, she has her hopes set on bringing the equipment to her own organization. “I already told them that interpretation has to be a part of our budget,” she says.